For this posting of the Design Team Projects for The Cutting Cafe, we focused on word shaped cards that pertain to Valentine’s Day. I chose to use the 14th Shaped Word Card, which can be versatile to be used not only for Valentine’s Day but for anniversaries, years, or a special date. I made two different ones. The first one features sentiments from the This Cake is All Heart, a printable stamp set from The Cutting Cafe. The second one uses one less layer and features a bow with bling. 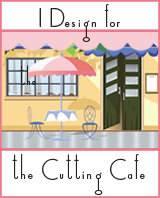 Be sure to stop by The Cutting Cafe Blog on the 7th and 21st of each month to see all of the design team’s projects. Leave a comment when you visit and you just might win three files of your choice. Thanks for stopping by. Of course I have a video before you go!